I've been working away making changes to my website trying to get the look and feel that's just right. I've changed the opening page to an illustration that I feel is stronger than the original illustration. I've also made a few other changes like the Jacque Pierro logo, I'm trying to get the over all look I want for my clothing, packaging, webite, logo, and anything else that comes along. 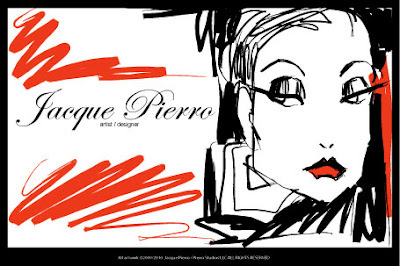 Here's the website again (another shameless plug) if you want to see the new updates www.JacquePierro.com and trust me there will be even more updates soon. Wow, it's 4:00 am, time for bed.